The countries listed below are in order of ease of travel for first-timers in their own vehicles, taking into account: expense, accessibility from mainland Europe and the challenges of bureaucracy, terrain and security. More information on these countries and specific route descriptions starts on p.423. All these countries except Sudan can be visited on organised tours but the conditions and comfort are more of a gamble in the more difficult destinations. Far and away the best place for a neo-Saharan introduction and a good holiday besides. Only the fringes of the Sahara encroach over ‘greater’ Morocco south of the Atlas and north of the Algerian border. The Western Sahara territory – Morocco in all but name on the seaward side – is all desert but only the Atlantic route to Mauritania is accessible. Elsewhere it's still a sensitive area until the Polisario question is resolved (full story on p.459, with map). The dramatic variations in scenery south of the snow-capped High Atlas are traversed by several short, clear-cut pistes. Furthermore, the thriving rural Berber culture along with the glories of the Imperial Cities add an extra element which make this an ideal country to dip your toe into the sand. But if it's the grand horizons of the real Sahara that you're after, you're better off heading elsewhere. Northern Morocco can also be hell for the culturally unacclimatised. Though apparently not as bad as it used to be, the hassle here from touts, trinket sellers and kids can drive you to despair. (In the south it's nowhere near as bad.) Not everyone finds the constant pestering unbearable, but the consensus seems to be that if you let it get to you, your experience of this great country will be ruined. If you're curious to explore the wonders of Marrakesh and Fez, consider leaving them for your return north. By this time you may have got the hang of the country and its ways. This book naturally concentrates on the desert regions in the south. Away from tourist towns the people are mellow and the mountain scenery magnificent. Fuel range is moderate and away from Erg Chebbi the going is rockier than elsewhere in the Sahara, all of which simplifies vehicle preparation somewhat. Morocco is a common destination as a shakedown for a longer overland trip. Similar to Morocco in Westernised familiarity but more laid back, Tunisia's drawback, certainly for Brits, is the expensive ferry required to reach it from Marseille or Genoa. But venture south of the camel rides and nomadobilia of the Chott region and you're in the tightly-packed dunes of the Grand Erg Oriental (Great Eastern Sand Sea), as definitive a desertscape as anyone could imagine. Unfortunately for motorised travellers these southern regions are hard to appreciate. A major piste trails a pipeline to the country's southern apex, but unless you're prepared to delve into the unmarked dunes, distances are small and offer little compared to neighbouring countries. The Grand Erg, however, makes Tunisia the easiest place to enjoy a camel tour deep in the dunes. Prices and touristic infrastructure are similar if not superior to otherwise comparable Morocco, while even in the cities, hassle from traders and kids is low key. Certainly for Brits, Tunisia is more of a transit on the way to Algeria or Libya. As it is located on what is currently the most used trans-Sahara route, many people shoot through Mauritania (sometimes abbreviated as ‘RIM’, Republique Islamique de Mauritanie). But venture inland and you'll find the Mauritanian Sahara gives you plenty to see without the restrictions that exist, say, in Libya, Egypt or Niger. This is still an essentially untamed country where you can do what you like without stumbling into military patrols or being forced to take guides (though on some routes they're a good idea). For an Islamic republic, Mauritanian society also comes as a surprise. More than anything else, the conspicuousness and relative freedom of women, from the poorest nomads to the city dwellers, is unexpected. Lighthearted flirtation unheard of in other Arabicised societies makes Mauritania a treat for visitors who normally get a male-dominated view of these countries. On the minus side, Mauritania's recently acquired popularity with trans-Saharan travellers is not lost on the famed entrepreneurial spirit of the Moors. Assuming you're not just crossing the Sahara (the Atlantic Route starts on page 464), a good region to start exploration is the Adrar plateau around Atar and Chinguetti; a mixture of dunes and plateaux with evidence of the thousand-year-old Moorish culture as well as far older relics. From the Adrar a route to Tidjikja (see p.481) makes an interesting way of getting south, while roaming in the desolate north and east of the country, you'll have the desert all to yourself. A West African favourite, Mali is the home of legendary Timbuktu. What's left of this celebrated town, for two centuries an emblem for remoteness and inaccessibility, sits close to the apex of the Niger River's northward arc into the Sahara. There's not much to see in Timbuktu and the hassle from the kids can leave sour memories, but the boast that you've been there is usually enough for most people, because getting to Timbuktu from any direction is still genuinely tough (see p.580). There is no developed ‘piste culture’ in the Malian Sahara, principally because the north of the country occupies one of the Sahara's two hyper-arid empty quarters (the other is the Libyan Desert) with few wells, a negligible population and a relatively bland topography. Furthermore, since the rebellion of the Malian Tuareg in 1992 (see p.413), the once-popular Tanezrouft piste from Algeria is barely used by tourists as the region has repelled government control. The activities of smugglers continue unhampered and, although it's possible to visit Kidal and the Adrar des Ifoghas, tourist cars that dare take the risk are still preyed on. So, for its size, the Malian sector of the Sahara is the least alluring and the least visited. Presenting a legendarily obstructive bureaucracy for temporary vehicle importation and deep desert exploration, few people visit Egypt just to drive around the desert. Indeed, many bless the day they finally manage to get aboard the Wadi Halfa ferry south into Sudan! And yet, between the Nile and the Libyan frontier lies one of the Sahara's most historically and prehistorically rich environments: the so-called Western Desert, part of the geographical entity known as the Libyan Desert which itself spans eastern Libya and northern Sudan. Logistically and bureaucratically access here is hard-won, especially with your own vehicle. People do do so unofficially which is a risk; a visit is most easily realised using local tour agencies and their vehicles. The focal points are the Gilf Kebir plateau in the southwest (location of the real ‘Cave of the Swimmers’ as featured in the film, The English Patient), the Jebel Uweinat massif where Egypt, Libya and Sudan meet, and the Great Sand Sea. One reason why this part of Egypt has never seen much traffic is that there are virtually no wells and therefore no inhabitants. Due partly to meteorological vagaries (explained on p.386) the eastern Sahara is much more arid than central or western regions. Consequently nomadism barely gained a foothold here and established pistes southwest of Dakhla are unknown. Nevertheless, this once obscure corner of the Sahara has become a fashionable touristic ‘last frontier’ in recent years. A string of new rock art discoveries, as well as evidence of the activities (before and during WWII) of the likes of Bagnold and Almasy make a visit to the ‘Gilf’ highly rewarding, even as a mere passenger. Less demanding excursions that can easily be done in your own vehicle include the ancient oasis of Siwa as well as the so-called Great Desert Road (sealed), which arches west from Cairo through the Western Desert via Farafra, Dakhla and Kharga to Luxor, though of course this is a faint backdrop to Egypt's world-class antiquities. Forget long outdated propaganda about terrorists and anti-imperialist aggression: Libya is nowhere near as dangerous as people would like to imagine. Around the turn of the millennium it replaced Algeria as an authentic true desert destination, until subsequent regulations limited independent travel somewhat. It also boasts the finest Roman ruins along the southern Mediterranean shore. In 2003 the crippling UN economic sanctions (long flouted by oil interests anyway) were officially lifted and almost immediately the procurement of visas speeded up. But, with the advantageous black market rates of the late 1990s having passed, and the relative expense of vehicle importation and the now compulsory guide, the brief promise of independent desert tourism in Libya may have lost its shine. Libya differs from other true Saharan countries in that its desert is much more developed, and what nomadism existed (mainly in the southwest) has been suppressed by urbanisation. Water, oil and military installations create numerous and sometimes confusing tracks, not all of which are marked on the most recent maps (only the most western parts of Libya received the attentions of the IGN mapmakers). And along the eastern and southern borders, mine fields from WW2 and the little known Chadian war of the 1980s add an unwelcome edge to off-piste exploration. The scenic and prehistoric wonders of the Fezzan region of the south-west are the highlight on the classic tour as detailed on p.560. Routes in the east of the country are longer, more remote and more demanding. At the time of writing it was not permissible to use Libya's southern borders for Algeria (Djanet) and Niger. Once anyone gets bitten by the Saharan bug, a visit to northeastern Niger's Aïr mountains, Ténéné desert and even the Djado plateau soon become desirable. Home of Tuareg and, in the east, Tubu nomads, the early 1990s saw the area cut off as the rebellion of these put-upon nomadic minorities brought trans-Sahara travel through Niger to a halt. These days things are less dangerous and ‘the Tï¿½nï¿½r’ (as the Nigeran Sahara is often abbreviated) is accessible again. However, it should be noted that since that time not a year has passed without at least one touristic group being robbed, whether travelling independently or with a local agency. The bandits are renegades from the ostensibly resolved rebellion: Tuareg in the Aïr, Tubu along the Djado plateau, and one or the other out in the Ténéné. Expensive official guides are mandatory to explore this area and, because of this, driving down here from Europe takes some commitment. But until you've seen this part of the Sahara, especially the eastern borders of the Aïr and the Djado plateau, you'll not have seen the best of the desert. The actual Ténéné in between the two is just a flat sand plain north of the Grand Erg du Bilma. Because of the continuing risk of losing your vehicle to bandits, a tour is preferable before committing yourself. Several companies in France, Italy and Germany offer two- or three-week tours of the Ténéné working out at around £100/ €145 a day all in. Doing it this way you'll be able to enjoy the experience with a bit more peace of mind. During the 1980s Algeria offered reliable access across the Sahara via two hard, but not too hard, routes: the 1000-mile Tanezrouft route from Reggane to the Niger River, and the shorter but more difficult Hoggar route to Agadez. Then in the early 1990s political troubles in the north as well as the Sahara-wide Tuareg rebellion shut down tourism and both of these trans-Sahara routes overnight. 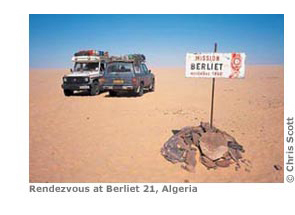 Then in 2000, with a reduction of violence in the north (which, incidentally, never affected the south), Algeria came back into vogue for desert travellers as Libya turned the screws on independent travellers. Sadly that promising revival was written off in March 2003 when seven separate groups of travellers were abducted in the Tassili Nï¿½Ajjer (full story on p.362). This unprecedented event set back tourism right across the Central Sahara, and the following season saw only a guarded return to the desert. Entry from the north is via Tunisia from Nefta, or from Ghat in Libya which brings you to the Sahara's finest landscapes and most outstanding prehistoric art in the southeast of the country: the Tassili Nï¿½Ajjer plateau near Djanet and to the west the Hoggar mountains around Tamanrasset. The border with Morocco has been closed since 1994 and although there is talk of a thaw in relations, the less scenically impressive Tanezrouft region has seen few visitors, associated as it is with established smuggling activities. Despite these drawbacks – part of the fluid pattern of African politics – for a single country Algeria offers the best of the Sahara. From sand seas to plateaux, winding gorges and mountain ranges, the full repertoire of Saharan landscapes can be appreciated by simply doing the classic Tunis-Tamï-Djanet triangle. Nomadism still flourishes here too, which adds greatly to the ambience of the desert, though guides are now mandatory from border to border. Check the ‘Algeria’ page on the website for the latest on security issues. Unhindered exploration is more than can be said of northern Chad. Here one gets into a realm of Saharan travel that has been unpredictable and dangerous for as long as Europeans have gone there. Never a mainstream tourist destination at the best of times, Chad's Tibesti mountains and Ennedi highlands are a lure for hard-core Saharans, but can only be fully appreciated during lulls in the protracted civil war/rebellion which has plagued the area since independence. Millions of landmines are the still-lethal residue of a disastrous conflict with Libya culminating in the late 1980s, though it is said that Russia is proposing to de-mine the little-used trans-Saharan route along the west flank of the Tibesti. With the right vehicle, experience and nerve, Chad's northern massifs and little-known Tubu culture will give you an adventure like no other. In your own vehicle, the challenge would be following your own pace rather than being pushed from village to town by expensive and sometimes unnecessary guides, jumpy soldiers and administrative extortion. At the time of writing the Tibesti was out of bounds and the Sudan border in revolt, but in between, tours from Ndjamena can reach as far as the Ounianga lakes and the rock art sites of the Ennedi. Two decades of bitter civil war have cut off tourism from what was once considered one of Africa's friendliest countries – and is still home to one of its most excruciating bureaucracies. Following the railway or even the Nile from Wadi Halfa was many people's introduction to Sudan. Venturing into the unpopulated Nubian Desert or the little-known oases of the northwest beyond the southern sections of the Darb el Arbain (see p.621) or the Wadi Howar is slowly emerging as a new Saharan destination for the committed but is still too marginal to warrant consideration in this book. People do come up from Ethiopia or Eritrea but in general all you'll see of the Sudanese Sahara is the L-shaped transit from the east to the capital and up to Wadi Halfa. Access from Chad in the west was good for a couple of years, but a rebellion in the Darfur region closed that border in late 2003.